The do's and don'ts of cell phone etiquette can feel like uncharted territory. If you want to be considerate to other people, these general guidelines will help you stay on track. 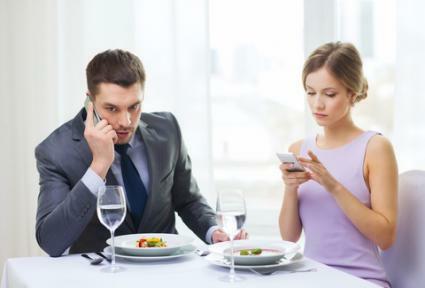 The most common cell phone-related faux pas tend to happen during meal time. This is true whether you're eating at home or at a restaurant. Do keep cell phone usage down to an absolute minimum. Engage with the other people at the table; don't just stare down at your phone the entire time. Do set your phone to silent or vibrate mode as to avoid disrupting the other diners with a loud ring tone. Don't use the flash function if you are going to take pictures of your food. Don't answer an incoming call at the table. Instead, excuse yourself from the table if it's urgent and accept the call in another room. Whether you are watching an independent film at a small screening or a major Hollywood blockbuster at the local multiplex, be mindful of how your actions may diminish the experience of the other patrons. This applies to attending live theater productions as well. Do put your phone in silent mode upon entering the auditorium. Better still, just turn your phone off. Do keep your phone in your pocket or purse for the duration of the film. 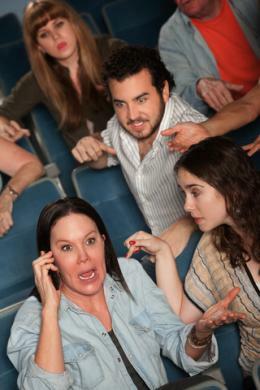 Don't take phone calls before or during the movie or production. Leave the auditorium if you must take a call. Don't text or email during the movie because the illuminated screen can be a major distraction for others. A cell phone is a communication device, so people are expected to use it in public spaces. Even so, good manners and common courtesy still apply. Do watch your language, particularly when in the presence of children. Avoid discussing overly private matters as well. Do try to maintain some distance from strangers when taking a phone call. Try to keep a distance of at least 10 feet. Don't use the speakerphone function in public unless everyone present wants to be included. Don't talk in an elevator, on public transit, in public restrooms, or in other small spaces. Don't take calls in quiet spaces like libraries, museums and places of worship either. Go outside or to some other area where you won't disturb anyone else. Cell phones are used for a lot more than just voice calls, and proper etiquette must be maintained when participating in other activities too, like playing games or chatting over an instant messenger. Do be aware of your surroundings. Try not to get in the way of other people as they go about their day. Don't send or read text messages while walking (or driving). You could accidentally run into someone or something. Don't use your phone while participating in activities with other people, like completing transactions with the cashier at the supermarket or the teller at the bank. Don't play mobile games in public with the speaker on. Use headphones or mute the game's sound. While the rules of cell phone etiquette aren't as stringent when you're relaxing in the privacy of your own home, you should still show some courtesy to the other people in the house. Do leave the room to take a call if you are watching television or socializing with other people. Do ask before using someone else's charger or charging station. Don't talk too loudly if you know other people might be sleeping. Don't use your phone in bed if the room is dark and your partner is trying to sleep because the lit screen can be annoying. Go in another room to use it. Most rules and considerations for cell phone etiquette apply when you're in the presence of others, but there are also rules pertaining to how you choose to communicate with your phone. Do reply via text message if a person texts you. Use the same form of communication as he or she used to contact you, whether it's by email, phone call or instant message. Do respond to text messages in a reasonably timely manner, even if only to acknowledge receipt. Don't leave a voicemail that simply tells the person to call you back. Let them know why you called while keeping the message as succinct as possible. Alternatively, send a text message. Don't use group text messages unless it's necessary and only when the message is relevant to all parties included. If you must borrow a phone from a friend or a stranger, be mindful of your manners and remember to say thank you. Do only use the phone for exactly what you asked for in the first place. Do keep your phone call as brief as possible. Don't swipe around to see other pictures when someone wants to show you a particular picture on their phone. Doing so would be an invasion of privacy. Don't take the phone out of someone's hand when she wants to show you a picture unless it is clear she is offering you her phone. What it all boils down to is that the etiquette of cell phone usage revolves around the idea of not offending other people as much as reasonably possible. If what you're doing bothers someone else, you probably need to stop and find a more appropriate time and place to continue your communications. After all, you'd want someone to extend the same courtesy to you.